Bryan Dunnewald appeared on Show 266, recorded in January 2013, at age 17. Bryan Dunnewald, (organ), 17, is from Arvada, Colorado. 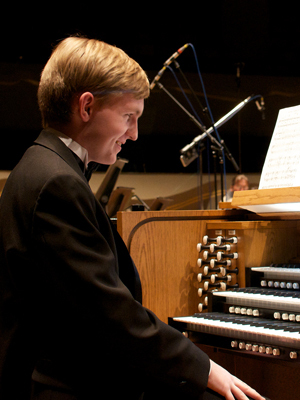 Currently, he is studying organ at Interlochen Arts Academy in Michigan with Thomas Bara. In addition to playing the organ, Bryan sings in the Interlochen Arts Academy Choir, and has also played the euphonium. An Eagle Scout, he enjoys designing organs in his spare time and also really likes disco music.